With networked HVAC control systems, most communication problems arise from a small number of relatively simple causes. With some fundamental knowledge of networking concepts and configurations, many of these problems can be solved by non-IT professionals, such as building operators and HVAC controls technicians. 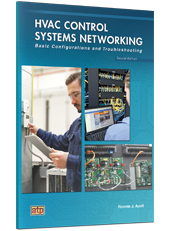 HVAC Control Systems Networking: Basic Configurations and Troubleshooting is an introduction to Ethernet networking concepts, hardware, configurations, and troubleshooting for non-IT professionals. This resource is essential for building operators and HVAC controls technicians working with web-based supervisory controllers.